Customers see a brand reflected in the images and text displayed in the in-vehicle human machine interface (HMI). EB GUIDE GTF ensures that the powerful graphical interfaces you developed in EB GUIDE Studio render beautifully and are executed on your target in the vehicle. Your graphics render on automotive heads-up displays; normal and full graphical cluster instruments; on medium and premium head units; as well as on industrial applications. You can use your HMI models on multiple operating systems and platforms. 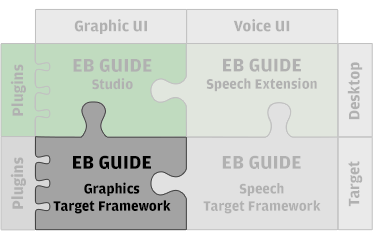 You can design, develop, prototype, test applications, add dynamic content for your HMI in EB GUIDE Studio, and then deploy the result on the target with EB GUIDE GTF. Because EB GUIDE Studio already uses EB GUIDE GTF for rendering while creating the model, you see exactly what the customer will see later on the device. Bring the HMI model created with EB GUIDE Studio to life on a target. Exploit OpenVG, the standard for accelerated 2D graphics. Exploit real hardware accelerated OpenGL ES 2.0. Make full use of any available graphics and hardware acceleration. Ready for future software standards and hardware generations. Effects library with built-in effects (coloration, fade-in, fade-out, rotation, scaling, shearing, translation). Communicate directly and quickly with applications on a control unit with the external application interface.